September 20, 2018 – San Diego, CA. More news of Monsanto/Bayer Corporations controversial weed killer called Roundup is still making headlines with many people asking if Roundup does in fact cause cancer. We’ll look at the time of scientific studies done and will let you draw your own conclusions. Roundup is an herbicide used to kill weeds and grass on home lawns, in gardens and on agricultural fields. The product was first introduced to the consumer marketplace in 1976 by Monsanto Company and has since been used by millions of consumers and industry professionals alike. Last year Bayer Pharmaceuticals purchased the rights to the Roundup product line. In the United States we have the National Toxicology Program (NTP). This contains a few different government agencies such as the National Institute of Health (NIH), the Centers for Disease Control and Prevention (CDC) and the Food and Drug Administration (FDA). 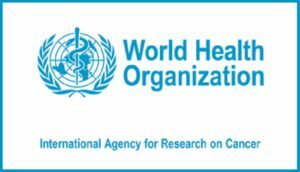 Their main work is to maintain a list of all chemicals “known to be [a] human carcinogen” or “reasonably anticipated to be human carcinogens”. Their latest update from November 2016 does not list glyphosate as a carcinogen. Does the recent Court Verdict prove Roundup linked to Cancer? In the August 12, 2018 court case Johnson v. Monsanto, a jury was asked to decide the likely cause of the illness, in this case a rare blood cancer called Non-Hodgkin lymphoma (NHL). The jury was pressed with specific questions. The following are actual excerpts from the filed court papers dated August 10, 2018. Case number: CGC-16-550128. DEWAYNE JOHNSON v. MONSANTO COMPANY. The bold type YES or NO were the jury’s answers. 1. Are the Roundup Pro or Ranger Pro products ones about which an ordinary consumer can form a reasonable minimum safety expectations? YES or NO. 2. 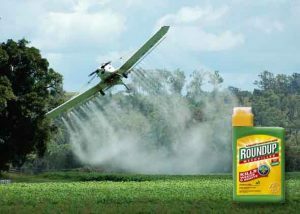 Did Roundup Pro or Ranger Pro fail to perform as safely as an ordinary consumer would have expected when used of misused in an intended or reasonably foreseeable way? YES or NO. 3. Was the Roundup Pro or Ranger Pro design a substantial factor in causing harm to Mr. Johnson? YES or NO. 4. Did Roundup or Ranger Pro have potential risks that were known or knowable in light of the scientific knowledge that was generally accepted in the scientific community at the time of their manufacture, distribution or sale? YES or NO. 5. Did the potential risks of Roundup Pro or Ranger Pro present a substantial danger to persons using or misusing Roundup Pro or Ranger Pro in an intended or reasonable foreseeable way? YES or NO. 6. Would ordinary consumers have recognized the potential risks? YES or NO. 7. Did Monsanto fail to adequately warn of the potential risks? YES or NO. 8. Was the lack of sufficient warnings a substantial factor in causing harm to Mr. Johnson? YES or NO. 9. Did Monsanto know or should it reasonably have known that Roundup Pro or Ranger Pro were dangerous or were likely to be dangerous when used or misused in a reasonably foreseeable manner? YES or NO. 10. Did Monsanto know or should it reasonably have known that users would not realize the danger? YES or NO. 11. Did Monsanto fail to adequately warn of the danger or instruct on the safe use of Roundup Pro or Ranger Pro? YES or NO. 12. Would a reasonable manufacturer, distributor, or seller under the same of similar circumstances have warned of the danger or instructed on the safe use of Roundup Pro or Ranger Pro? YES or NO. 13. Was Monsanto’s failure to warn a substantial factor in causing harm to Mr. Johnson? YES or NO. 14. What are Mr. Johnson’s damages? 15. Did you find clear and convincing evidence that Monsanto acted with malice or oppression in the conduct upon which you base your finding of liability in favor of Mr. Johnson? YES or NO. 16. Was the conduct constituting malice or oppression committed, ratified, or authorized by one of more officers, directors, or managing agents of Monsanto acting on behalf of Monsanto? YES or NO. 17. 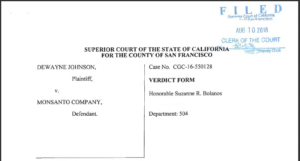 What amount of punitive damages, if any, do you award to Mr. Johnson? What does this Monsanto Roundup Court Ruling mean to me? For people who have been exposed to Roundup Pro or Ranger Pro weed killers this is a landmark decision. It has exposed the company’s negligence and their willingness to cover up evidence to harm in favor of profits. This has now made it easier and has set precedent for more than 4,000 cases that are already lined up in various courts across the United States. Now anyone who has been diagnosed with any type of blood cancer from the use of Roundup can sue Monsanto for failure to warn.